Meeting with Chris and Jason Brochu at a coffee shop directly between their eastern white pine mill in Ellsworth, Me. and their corporate headquarters, and spruce mill, in Dover-Foxcroft, Me. reminded me of what I thought writing sawmill stories stories would be like: Filled with laughs, some tough questions and a fair amount of company pride. We had a great conversation and I was able to head from our meeting place, down the coast of Maine to their eastern white pine mill, right before it began shutting down for the day. 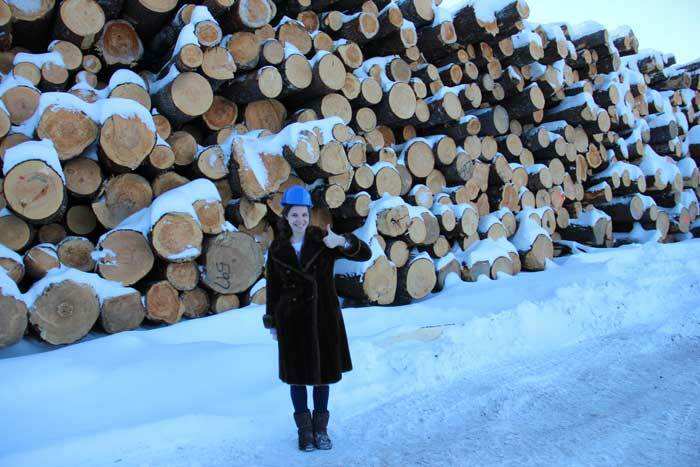 As my first visit to an eastern white pine mill, and my first snow covered mill, I was in awe. Such a beautiful place, and the smell was out of this world! Nothing like the pitchy SYP I am used to. And the snow! I am still in awe of the snow. The Brochus story is an interesting one, going from one mill to five over a very short period of time, and the energy the brothers have is palpable. Their company’s story will be in the May issue of Timber Processing.